Although keeping fancy goldfish in an outdoor pond year-round is not an option everywhere due to climate differences, setting up a fancy goldfish pond even just for the summer can be a fun project. (Temporary) life in a pond is often beneficial for your goldfish when done right and it can also lessen maintenance time for you. Keep reading for more info about keeping fancy goldfish in ponds and tips on starting your own pond setup! Which fancy goldfish types can be kept outside? You can keep any type of fancy goldfish outside in a species-only pond during the summer if temperatures don’t regularly exceed ~85 °F/29 °C. 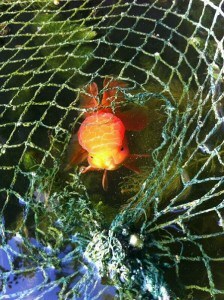 Please don’t mix your fancies with single tailed goldfish or koi! If you live in an area where temperatures stay above freezing year-round, the fish can stay outside in an above ground or below ground pond the entire time. If temperatures do drop below 32 °F/0 °C but it doesn’t get too cold, there are still a few fancy goldfish types that can stay outside year round in a below ground pond. The pond should have some parts deep enough to not freeze entirely; most goldfish keepers recommend a depth of around 4 ft/120 cm. Fantail goldfish as well as oranda and ryukin have been reported to be able to survive the winter outdoors in moderate climates when proper winter precautions are taken. Be sure to always keep a small portion of the pond ice free; some goldfish keepers with smaller ponds also choose to keep the water running during winter by using a heater. If you’re unsure whether your goldfish are safe outdoors during winter, I would personally not go for it and just wait until it’s spring or summer again. If you do think you can keep them outside, be sure to do extra research on pond winter care! Oranda goldfish may do well in ponds year-round. Keeping your fancy goldfish in a pond year-round or for the summer has a few benefits for the fish and for you. For the fish, it means a larger container and more room to swim. Because bigger is always better when it comes to fancy goldfish, you’ll likely see some significant progress in their growth, especially if you keep up the water changes. During summer, algae growth will often occur in ponds, especially if they are in the sun during part of the day. Although green water isn’t always the most pleasant thing to look at your goldfish will actually appreciate it! Algae growth on the walls can be nibbled on round the clock, which is what (fancy) goldfish actually do naturally. This contant supply of little bits of food improves their growth and promotes vibrant coloration. Although the initial setting up of a goldfish pond can be hard work, especially if you’re actually digging one and not just buying an above ground tub, this repays itself once you move the fish out of their aquarium. If you keep the pond understocked (which is definitely what I’d recommend! ), the amound of maintenance needed decreases drastically. Running around with buckets of water once or even twice a week is no longer necessary in most cases; water changes can be done using just a hose and less frequently. For example, because I use an above ground tub similar to this one as my “pond”, I can just drain the water into the garden (which the plants really appreciate) and refill using a long hose connected to one of the taps inside the house. This means I don’t have to touch a single bucket for the entire summer except when I’m rinsing filter material. If you’re interested in moving your fancy goldfish to a pond for a period of time, here are a few things to keep in mind! Remember to never move your goldfish outdoors when it’s cold (during fall, winter or early spring). The best time to move them is during early summer when the water has had plenty of time to warm up and the temperatures in your pond are similar to those in the aquarium. 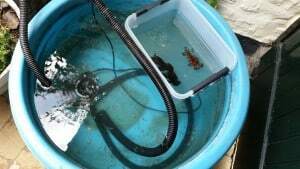 Before moving your fish your pond should be cycled, preferably with a large pond filter kit as they have tons of room for biological filter material. Smaller ponds can be quick cycled by taking filter material from your indoor filter and using it in the pond filter or just moving your indoor filter over entirely! I use a pond filter on the goldfish tub year-round, so I could just move the whole setup outside. If necessary, be sure to re-cycle your aquarium before moving the goldfish back. When moving your goldfish, be sure to give them plenty of time to adapt just as you would when introducing a new fish into your aquarium! They don’t react well to sudden changes in water chemistry and temperature. Proper acclimation is very important! When fall comes around and it’s time to move the fish back inside, don’t wait too long. If the pond water is already cold, warmer aquarium water can be a big shock and possibly fatal, especially if your fish have already gone into winter hibernation mode. Always use a net on a fancy goldfish pond. Fancy goldfish are very slow and not able to escape predators. You may not have outdoor cats, but your neighbors might! In some areas, there is also the danger of wild animals such as raccoons or herons which will not pass up such an easy meal. If you’re scared kids/cats may fall into the pond and get tangled in the net, you can also use another material such as chicken wire. I’ve moved my own fancy goldfish outside for summer twice now it’s been very enjoyable both times. The fish grow very quickly with all the water changes and really seem to enjoy nibbling on some algae! I’ve read reports of fancy goldfish being kept in outdoor ponds year-round in my area, but due to the fact that telescope eyes are a bit more fragile I’ve chosen not to go for it myself. The fish go back inside in September. If you have any more questions about keeping fancy goldfish outside or if you want to share some additional information, feel free to leave a comment below. Happy fancy goldfish keeping! I have a beautiful Oranda in with several single tail goldfish in a 300 gallon underground pond. I have had “bullying” problems before too so I just made sure my Oranda was the biggest babe on the blvd! She’s at least five inches maybe 6 and the biggest one of the commons is 4 to 4 1/2. She pushes right in to the feeding frenzy and reigns as queen! I have enjoyed having her there very much. The commons are like “queen’s subjects”! Hi, why can’t you mix fancy goldfish with “normal” goldfish? I have a small pond outside with 5 goldfish and I have one tank inside with one fancy goldfish that’s getting to small for it. So I was wondering if I can pot my fancy goldfish with others in the pond? Would they hurt it? Thanks for answering. No, they won’t hurt it and they’ll shoal together just fine. The reason I mentioned this is because fancies are much slower than common goldfish, which can mean trouble during feeding time as the commons might end up eating everything before the fancy has a chance to. If you have a way to work around this and/or are willing to pay a little extra attention to the fancy during feeding time it should be fine. 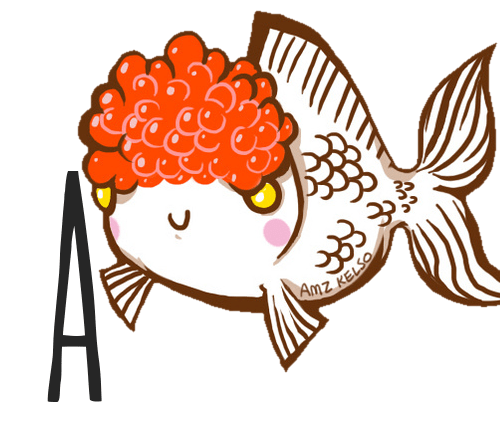 Additionally, keep an eye out for any spawning behavior. If the fancy is a female, harrassment from the quick male commons trying to spawn with her might really stress her out. Single tailed fish are much faster swimmers. Food competition and spawning behaviors can be deadly for your fantails. I have mine in 2 separate tanks outside. Everyone is doing well, flourishing and happy. I assume you meant to reply to the poster above this one? Thanks for your input! I haven’t tried it myself so this is helpful.